It started out as a meetup invite to all members to participate in one more of their enthusiastic trips which are fast becoming known as the adventure group tours!! 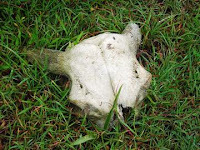 The trek was to Masinagudi (kudi?we are still not sure!!). To the uninitiated, it is somewhere deep in the Bandipur reserve forests in South India. Most of us RSVP-ed without a second thought- honestly though, after numerous jungle trips and tiger views in the likes of Corbett, chila, ranthambor ,Sariska, bandhavgarh, and other animal sightings some years earlier in Bandipur, madhumalai, and periyar, I was personally dithering a little…thanx to manisha (but OF COURSE) I too RSVPed quickly! (We all know now, how her enthusiasm rubs off)….And am I glad I did!!! The group was a young lot, all professionals, most from IT and related fields…and apparently all really really keeeen to ‘get away’ from it all. These ‘young people’…some even in their forties and fifties, decided to test their mettle against the pachyderm-ous Nagarhole-Mudumalai-Bandipur-Wayanad contiguous forest range covering the three states of Karnataka, Tamil Nadu and Kerala . I MUST add here that it was heartening to note that there were seven very enthu women in the group! It was Maria who took the cake – literally…she celebrated her 50th Birthday on this trip!! And then we were joined by Diyanat’s extended family, and met the youngest member any adventure trek has seen on this meetup- Razzak! All of 12 years old and a 6th grader from NASR.. Vow…what a range, from 12 year old razzak to the 53 year old Ranjan!! And there was no lack of the bubbly(not the alchoholic variety) !! the adrenalin rush took care that all remained on a high throughout!! The forests, one was told, are seemingly endless- spread well over 10000 square kms, as they merge one into another . The only difference at times is in their names…madhumalai, bandipur, nagarhole,wynad,……and so on…We, the group, left Hyderabad on August 13th evening by the KSRTC Bus, via Bangalore to reach Mysore at about 9 am on 14th. Rajan decided that breakfast was a while away yet, and quickly put us all on the smaller swaraj mazda which was to reach us to Masinagudi by 2 pm. It was in the small bus that all the group got to introduce ourselves to each other. It was also here that Maria announced it was her Birthday…and we all sang ‘happy bday…’ to her! She promised to get a cake for all of us- dunno why she thought it would be possible in the jungle though. Now most of us are sure she was pulling a fast one on us, and meant the pachyderm-dung cake that we found aplenty throught that eventful Saturday ..up the mountain and down the mountain, ….i am sure I heard comments about how Maria would not be able to ‘cut’ one, or how the other dung-pile-cake was softer and so would be easier to ‘cut’… yuckee!!! We took a small detour and went up to the 700 year old Himavad Gopala swamy temple located on a high point in the bandipur hills. The view around was beautiful, with little trekking trails leading out in every direction. It was coincidentally Janmashtmi ! 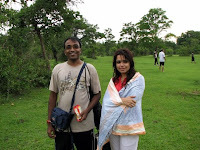 We enjoyed the beautiful lush greenery for sometime, before heading for our destination. And then we reached Masinagudi, (with all tamil-knowing people insisting it was ‘Kudi’, not ‘gudi’…even expaining what the word meant…)…I am following the official government of India signage and staying with the ‘gudi’… As we neared our yet unknown place of stay, Rajan started jumping in his seat…’red car…red car’ he cried, one hand frantically pointing at a red care parked inside what looked like a farmhouse with a coconut grove…yea, so?? Well…apparently he recognized it as Ali's car, and declared we had reached our destination. Sure enough, as the bus rolled into ‘whispering windows’, there were the four other members of the trek waiting for us…Ali, javed, gauhar and little Razzak….we said our hellos and promptly the ‘girls’ rushed to occupy the first room visible from where we stood…all seven into one. We discovered there were only four rooms and 24 of us…so there was little choice. Honestly though, it was a much grander place of stay than any of us had envisaged…in fact to some it was a little disappointing that we were not in more rustic surroundings. Most, however, I am sure were happy to be in a clean, hygienic, safe place to stay- what with tiled bathrooms with hot water (promised, not delivered though…)..hot fresh food, lovely verandahs to sit-out in, and a bonfire to boot!!! Deep inside we city born n bred people are creatures of comfort and rarely will the majority be happy to face creature discomforts!! We all loved the place, which, the landlord Suresh, and his wife Padmini told us, was a new construction, barely 3 months old!! 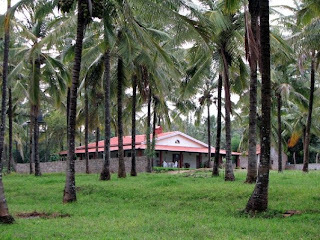 They had decided to convert their ancestral home into a resort . While waiting for business to pick up, they come down from Ooty, where they live, to tend to the place every weekend or so. They were personally taking care of all the service, food, cleaning, with the help of the retainer copule who doubled up as the security personnel at night. In the day they helped Padmini cook our meals!! 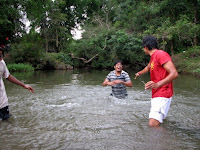 and then, sundar fell right into the water… it was a signal for the guys to jump in…they had just started to freak out, when they decided to be courageous!! Suddenly they all started splashing water over the ladies sitting pretty in the centre of the stream…there was no where to run…the damsels gave in…they were all in the water, and what chaos ensued…total water play and fun…suresh watched from afar, slightly bemused! We returned to the resort for a welcome hot tea and coffee. Thereafter, a night safari was planned. Once again we were bundled into jeeps and the van, and off we went into the dark jungle night, al excited and maybe just a little apprehensive…would we meet the nocturnal crawlers? You bet we did…..but not of the animal variety.. mostly of the man made machine variety…they were all over the jungle on the roads leading through it..honking , purring, their throttles and screeches certainly scaring away any animals that may possibly have been around. These trucks cars, tractors, lorries with their constant honking and harsh lights put paid to any hopes we may have had of viewing wildlife. But then lady luck took pity on us…and we saw them herded along the highway, sheltering their young ones, and waiting for a break in traffic, so they could cross over!! They dined on the grass and green trees as they waited…and we all watched in awe. The pachyderms in all their glory in the wild, and just a few feet away from us. It was humbling in a way to be upclose with these huge creatures patiently waiting in the dark. I have been upclose with elephants with their houdas ferrying tourists up to the Amer fort in Jaipur numerous times, but this was a different feeling altogether…. We returned to the resort , and were delighted to find a bonfire ready and ablaze! We huddled around chatting, laughing and joking, till it was time for dinner. 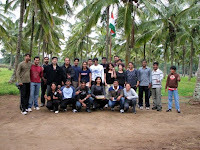 It was pack up time, thereafter…we were to leave for THE TREK early next morning! The morning turned out to be a drizzly one! Clouds hung low over the high hills around the resort, and the effect was picture post card perfect…most of us could not stop clicking pictures, trying to capture the all the beauty digitally!! I sneaked out of my room early looking for hot water and salt…the throat and nose were succumbing to infection, and I had no intention of staying away from the TREK because of some bad bacteria attacking my nasal passage and olfactory system…nor did I intend to make this public knowledge…what if they decided not to take me along, or some such thing?? Padmini was a sweetheart. she heated cups of water for me on demand, even if it disturbed her workflow in the vary makeshift litchen! The gargling worked! We all were ready, breakfasted, and lunch backpacked. And then it was time for the Flag hoisting and the National Anthem. It was August 15th , 2009! Vibha distributed homemade laddoos to all at the end of the anthem, and we all went trigger happy again…clicking pictures. The guides who were to accompany us- ram , lakshman, and Mahesh – were all set, and with last minute instructions from Suresh to all, we set off. click- happy went some of the group, getting close up shots of the cow vertebrae, till they had to be pushed to carry on and not stop and break up the group… it is easy to get lost in a jungle, and always advisable to keep close to each other.. we kept up the pace in a single file since the bushes left little scope for more than one or two persons to walk abreast. After about 7 kms of walking and sighting barely a deer, we reached the high hills and the deep valley. The river was somewhere down there. After another picture session, where we spied elephants bathing far below, and looking no larger than small black points on our camera screens, we all started the climb down..
What a downer….i fell trying to find a foothold to begin with…and lost a lot of my confidence. It was still high up in the mountain, and we still had a looooooong way to go before we reached the river. It took us 2 hours of struggling, slipping along the grass, holding the tufts, avoiding the small snakes and insects, slipping on the pebbles on the slope, encouraging each other, laughing, despairing at the distance from the top to the valley below, before we finally landed there. Just about 500 feet from the bottom of the valley we stopped dead. The elephant herd we had watched bathing from high above, was now on its way up the hill….thankfully it was moving away from us. Silently we watched them move away, before proceeding on our way. Ahh …the cool water again. It was our turn after the elephants… Immediately the shoes were off, and all were knee deep in the water. It felt heavenly. Some bathed , some just dangled their feet, and of course, everyone took pictures, and then some more!!! Food glorious food , with requisite spoons and the like was passed around soon after. Everyone sat around, ate, and then there was more picture clicking…. It was time to start back soon after. The day had been cloudy and night would fall quickly in the jungle and the valley. What shook some of us however was the realization that it was now time to climb the mountain we had just come down!! There was no other way…no easy way out but up!! We all did not take it too well..i think I ranted and raved to myself …maybe even to the guides! But good natured guys that they were…they just smiled and declared…’bas thoda hi hai madam’…. This slope that we were up against now, was very user-unfriendly!! Though a little while ago, it had not seemed so to the elephants who had climbed up and gone ahead!! Unlike our imagined slopes where there always seems a pathway zigzagging along the mountainside, there was none…or was it there and we did not see it?? Amateurs that we were, the hurry was to climb up fast and in a straight line from the bottom facing the top..
in retrospect, probably taking small zigzagging paths would have been a lot easier. But we were rattled , not finding footholds easily, holding onto grass roots-(thank god for the thick elephant grass , which took out weight as we hoisted ourselves up), and some of us moaning that we would never make it ( me included)….then there were the bravehearts – Maria being one….who took the path less traveled along the mountain side, and came up just 200 yards from the elephants!!! What foolhardiness, it seems now…..but back there in the wilderness, it seemed to be bravery of some sort.. Thanks to all the young men out there, and to the guides, I could make it to the top! Huh!! All the drinking water the group had was over by now, and we licked the glucon D powder Vibha the doc handed out! It helped us stay alive for the next two hours.!! We brisk walked through the forest , and the guides decided to take a new route!! What fun…with the night falling, 7 kms to go, rain threatening to come down, and infighting happens amongst those who need to show us the way out…But some how the group remained lighthearted. The throat-chakra gang was at it again and had to be physically separated!! They yapped more and walked less otherwise!!!! And then we saw the ‘tower’!!! what a wave of relief!! The ‘tower’ was next to the resort and so now we were just about to walk out of the forest, ….or so it seemed!! But why were the guides walking away from the tower?? it took a while before we figured out that they were avoiding meeting any forest officials, as there was a warning against going into the jungle!! The ‘ tower’ was a joke for quite a while thereafter!! We all sang along, and talked away in the mellow evening..Some however had not had enough of walking…they went off to the village to buy ‘fruits’!! The bonfire came with an addition this time. There was a bar-b- que on. By 9 pm the chicken and paneer were on the grill…and then Ranjan suggested ‘patthhar ka ghosht’…so a stone slab was located. Suresh and Padmini have a new dish to master now!!! Post dinner, no one wanted to sleep. Everyone went chatter, chatter, chatter!! Good and raunchy jokes, poking fun at each other, story telling and generally bonding went on late into the night…or shall I say well into the early next morning…early enough that when some decided to sleep, the maid had come in to start preparing the breakfast!! A lovely cool cloudy morning again, and we enjoyed our morning cuppas…and then demanded some more again! A filling poorie and sabji meal later, we said goodbye to our hosts, exchanged business cards, telephone numbers, email ids, and this time a trifle gloomily left on our trip back home. However it was not over yet. 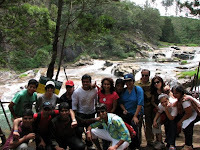 We went upto Ooty, and then on to Pykarra falls. Beautiful sight, but too many half dressed people bathing! Not so beautiful, of course! The place was rather crowded. We all enjoyed the carrots ooty is famous for, and some of us bought loads of them., only to be followed by cows!! Roasted corn and juice later, we were on our way again, but not before some of us had some monkey experience - komal lost her pack of chips to the redfaced guy…we heard her scared scream a long way away!! It was picture clicking time all the way thru the jungle till we emerged on the highway to Mysore..racing against time because our bus to Hyderabad was at 4 pm. But we made it, and collapsed in the bus! The driver seemed pretty pleased to see us again, and had a huge smile on his face! Yes, it was the same guy who had got us on 13th to Mysore in the same bus!! Kudos to Diyanat, and Rajan, for all the effort ! Thanks a ton guys!! And to all who were there….lets do it one more time…!! !hip hip…hoorrayyyyy! Interesting write-up. Must have been a memorable experience with such a diverse group!! woohoo! and to think i didnt even know she was such an awesome writer! loved reading this! and yeah Masinagudi we went to was nothing like this! bah!! hope to read more of your adventures!